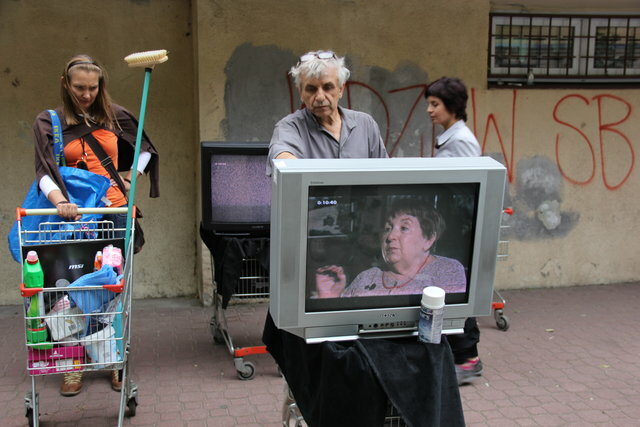 Co- production Isreal – Poland, Lodz 2012. 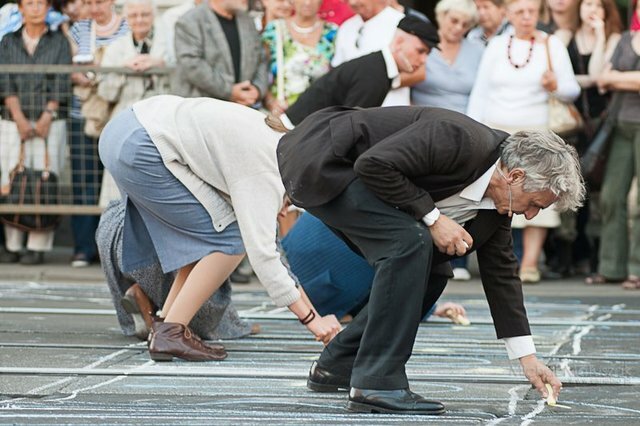 The project is a site specific event, constructed as a journey to the places, stories and people from the Lodz Ghetto. Our purpose was to make an honest, contemporary dialogue with the ghetto, the places, stories, people, and the memory of the ghetto; the past connecting to the present, the daily life in this area, our life, and to find out what is really happening during this dialog. 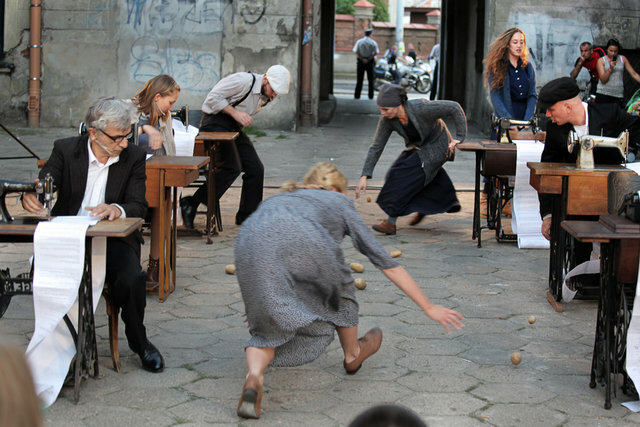 It is a journey in which the audience walks between the original spaces in the ghetto, moves alongside the actors through various places in the ghetto, wartime original buildings which were transferred and which are now used for various purposes. 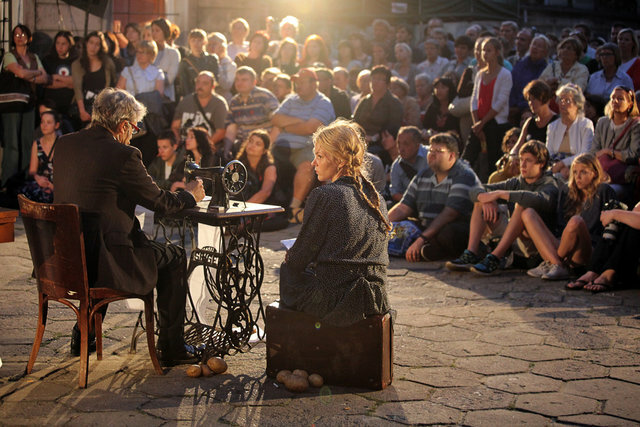 Selected sites and buildings serve as “stations” during the journey, each place hosting a story connected to the site, through a “dialogue” with the space as it is today. 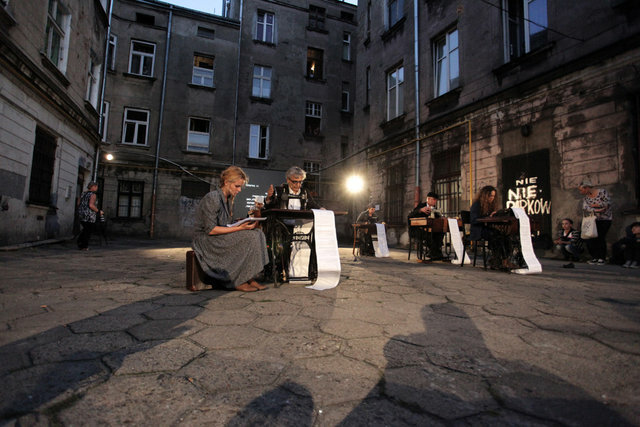 This post will be divided into two parts: in the first part, I will write on the process of and the rehearsal on the project “SZPERA’42” and in the second part I will write about the project itself, which took place on September2012 inLodz-Poland. Over the next year I will add a third part – the project inIsrael. The decision to create a theatrical work that engages The Lodz Ghetto and takes place in the original spaces, derives from my background. My grandmother was a Holocaust survivor. She was born in Lodz, and lived there between 1940-1944. She was exported from the ghetto to Auschwitz and then to a labor camp. My grandmother survived this terrible war with her two sisters. For most of my childhood and adolescent years – I grew up and lived with my grandmother. I was deeply attached to her. My grandmother’s past, her experiences and her stories, left me with an unforgettable impression, which shaped my identity. 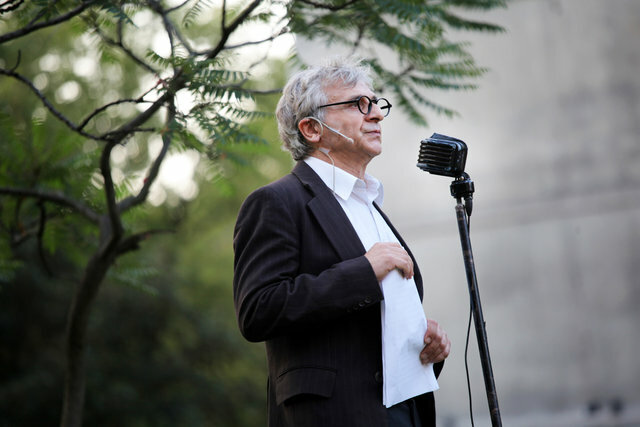 At this point in my life, as a theater artist, I choose to make this fascinating, personal and professional journey in order to create a work that “will establish life” and will spark stories and memories of people, places and events from The Lodz Ghetto. I see this as my right and as a mission. This work is a journey through the intricacies of private and collective memory, through the road connecting past, present and future – within the boundaries of life and death. 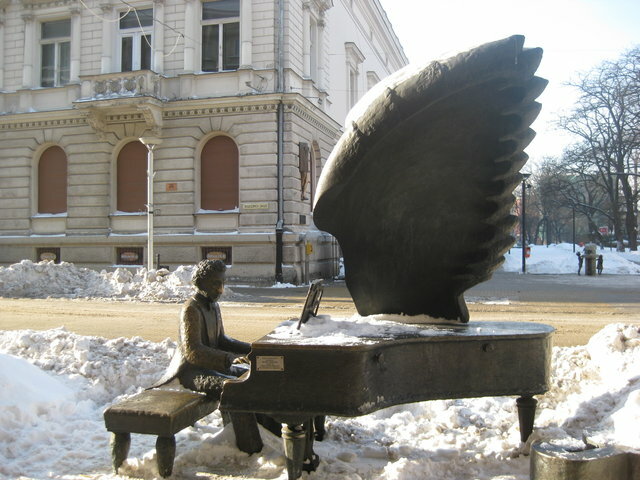 In December 2010 I first visited Lodz. I received a scholarship from the Polish Institute in Tel Aviv in cooperation with Adam Mickiewicz Institute in Poland. The purpose of my trip was to get acquainted with the places, to gather material for the future project, and especially to meet people from different fields who can help me with the project. Another central goal of my trip was to find partners that would like to collaborate in joint creation. This wonderful and meaningful visit left me with a strong impression that has upheld my wish to proceed with the project. Fortunately, I met wonderful people from different fields whom have offered me their help. This visit led to a special meeting with the director Tomek Rodowicz and the “Chorea” group in Lodz, which I quickly understood, where ideal partners for the project. Tomek and the group hosted me kindly with generous heart. They have also expressed an interest and desire to cooperate with me. Together we toured the ghetto and learned about the places. At the end of my visit, Tomek and I decided, that we will try to do this project together. From our first meeting, I felt that Tomek and I have something in common. I knew that it will be a unique experience to work with him and learn from him. 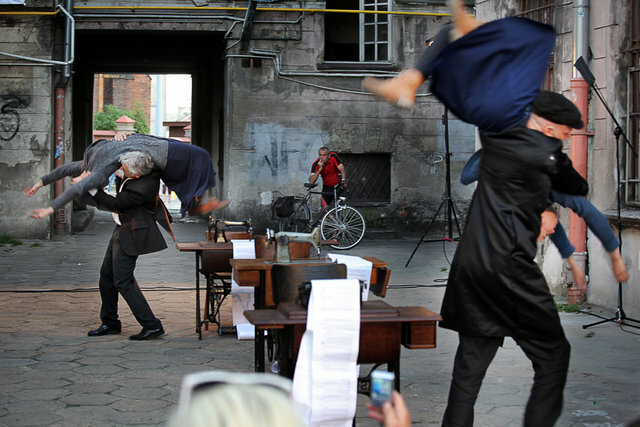 Tomek worked with Jerzy Grotowski for a long time and when I came to Lodz he had just made a performance based on Grotowski’s texts. My first encounter withLodzwas shaking and powerful. It was winter 2010.Lodzwas Snowy and icy. I came on the Purpose of finding two things: the co-creator for my work and the grave of my great grandmother. I walked on the snowy streets ofLodz. Lodz for me was like “The Land of Oz” I had always known of its existence; its absence was present at every moment in my grandmother’s life, so getting to Lodz was like a journey to a lost land..
That month in Lodz was very significant to the creative process. Most of the time, I wandered alone around Lodz or sat and wrote in cafes on Piotrkowska Street. I studied and felt Lodz. I tried all the time to check if I could hear the voices from the past in this place. 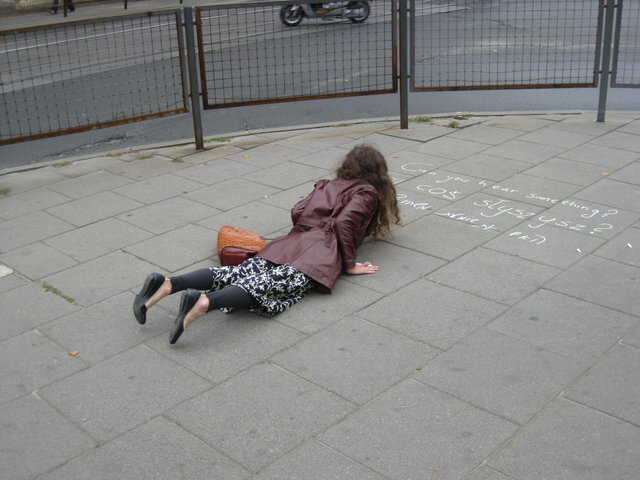 I lay down on the sidewalk next to the words, exactly at the junction between the Church of Mary and Kościelny Square, in the place where the famous Bridge of Lodz ghetto had been. Waiting to see if I could hear something? Maybe someone else in the neighborhood might also hear something, might be able to answer my question. Amazing how a simple action in space and time indicates the place where it occurs. Two minutes after writing on the sidewalk, an older man came up to me and patted me on the face, sure I was drunk. The First association of passer-bys was that I was drunk. Does this point to the problem of alcohol in Lodz? Does the fact that all the people who had approached me were adults mean something? After seven minutes, the police came. They pushed me away with the explanation that “It’s a public space”. They asked me to show them my passport. When I answered “Israel” to their question “Where did you come from?” they said to each other in Polish “nerwowy”, not knowing that every time I made problems in my childhood, my mother and father told each other in Polish that I was “nerwowy”. On the other side of the road, a group of young people in their twenties are standing and looking at me, drinking beer, laughing. It is the middle of the day and they have nothing to do. I go in their direction. I stop by them and listen to the wall they are leaning on. 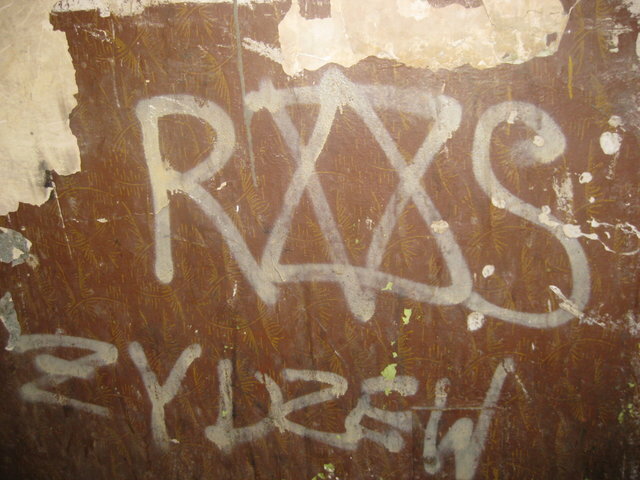 They tell me: “we know what you are doing; it’s because of the ghetto.” They take me to the building where they live, show me buildings from the Ghetto and explain to me the meaning of the graffiti that can be found all over Lodz of the letters R/T/S and a Star of David in the middle. This is how football clubs in Lodz call each other. I ask “Why the Star of David?” They lie at first and then admit, “it is a curse, you know”. After this visit to Poland, we get into another six months of intensive research about Lodz Ghetto: interviewing survivors, meeting people who are related to Lodz Ghetto and reading the “Chronicles of Lodz Ghetto”. Tomek and I chose the places where we are going to work and the artists who will participate in the project. 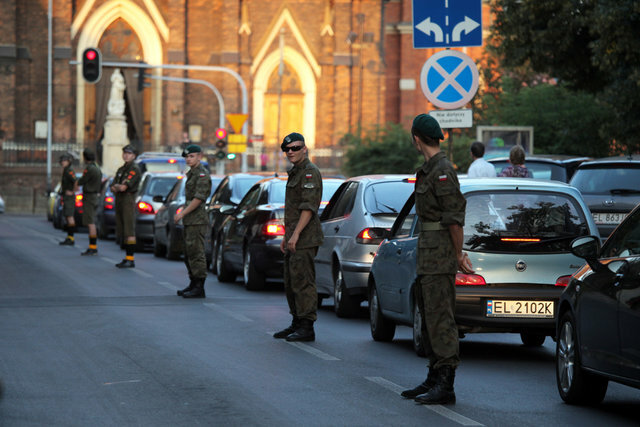 On April 2012 we traveled to Poland for one month of rehearsals. With me are Yoav Cohen, a video artist, and Yoni Eilat , a Yiddish-speaking actor and singer. During this month we performed on “Yom Hashoah” (the memorial day of the Holocaust ) with a small part of our project in front of 150 young Poles. Part 2: “SZPERA’42” – The creation. 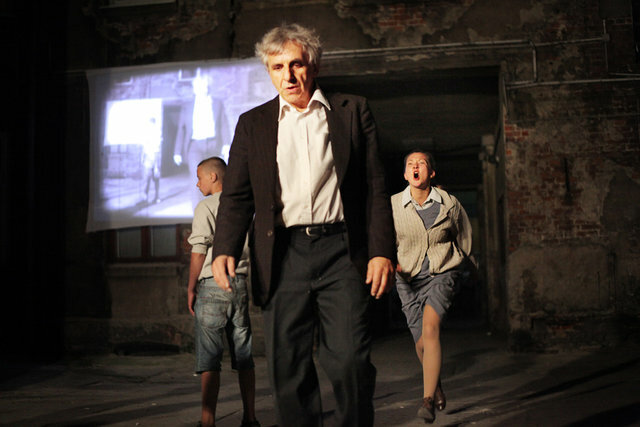 In August 2012 we arrive in Poland for the last rehearsals and perform three times: first in the Chorea Festival “RETRO/PER/SPECTIVE 2012”, second on the 29th August – the Memorial day of the liquidation of Lodz ghetto and third on the 4th of September – a special event for the 70th anniversary of the “Szpera” in Lodz Ghetto. It is one of the least known and at the same time most important places in the Łódź ghetto. At 13 LutomierskaSt., the offi ces of the Jewish fi re brigade were located. At the back of the building, at a large square, there were the fi re brigade barracks with cars and equipment. It was there that Chaim Mordechai rumkowski, the Eldest of the Jews in the Łódź ghetto, gave his speeches. 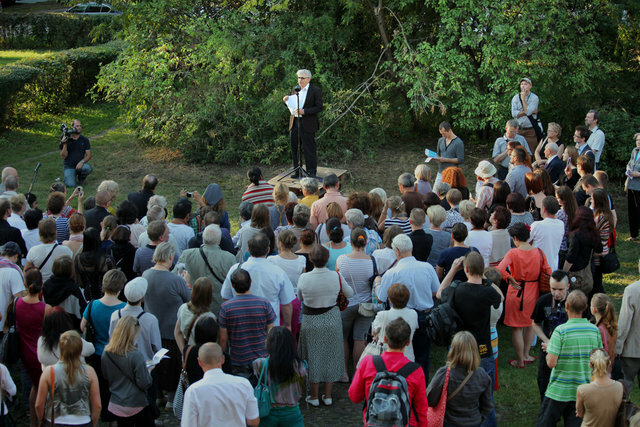 A podium with microphones and loudspeakers was placed there, so that rumkowski’s words could be heard everywhere. The buildings at 13 Lutomierska St. no longer exist, replaced by blocks of fl ats. Only one of the houses survived (at 14 Zachodnia St.). It was in front of that building that rumkowski gave his famous speech in September 1942,asking the residents of the ghetto to give away their children so that others may be saved. At the first time we got to the place where Rumkowski spoke his famous speech, I was amazed to see that today there is a kindergarten there. The most famous sentence from Rumkowski’s speech is “Mothers Give me your children” and today, 70 years later, in the very same place there is a kindergarten. I often have the feeling that the past and present conduct an intensive dialogue between them and we only come with a beam of light to illuminate the dialogue that occurs anyway or put a microphone to hear it louder. We are basically a third party. The dialogue is going on with or without us. The kindergarten in this place is living proof of that. Two streets, Zgierska and Limanowskiego, were excluded from the ghetto and belonged to the Aryan part of Litzmannstadt. The ghetto, intersected by these two streets, was divided into three parts. At fi rst, at specific times, special gates were opened through which the residents could move from one section to the other. 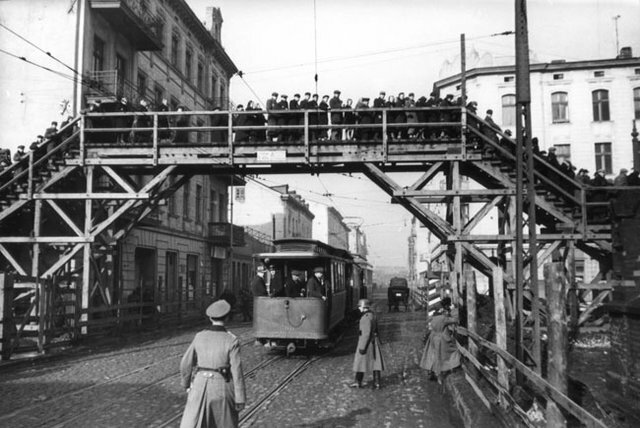 In the summer of 1940, three wooden bridges were erected, connecting the divided parts of the ghetto and allowing people to cross over the streets. It was clear for us that we would want to commemorate the Bridge. This is the most famous image of Lodz Ghetto, located in a very central place and represents the separation of the Jews , their inability to walk on the road on Zgierska street and of course the prohibition to travel on the tram and maybe, in some kind of ironic way – their being “elevated”, “closer to sky”. During our rehearsals in April, I told the group that my grandmother’s favorite song was “The whole world is a narrow bridge and the main thing is not to fear at all”(words by Rabbi Nachman from Breslav and lyric by Naomi Shemer) I remember my grandmother singing it quietly and getting strength from it. When I told this to the group, Yoni Eilat naturally began to sing the song, his voice filling the hall of the church. It was a chilling moment. He then taught the group the song. During the performance, the Polish Choir accompanied us singing this song. The Bridge , as a metaphor of the world, merged with the bridge of Lodz Ghetto and the urge “Not to fear at all” took on new meaning. We decided to draw the bridge with white chalk. The chosen material was chalk because of its impermanence in the world and the obvious fact that it can be erased, perhaps because of rain, perhaps because cars and people pass over it and maybe due to time. Maybe like a memory that is always threatened by oblivion. And when something is physically erased, does it still exist in another dimension? A Spiritual dimension? In Consciousness? Questions about the existence of memory. 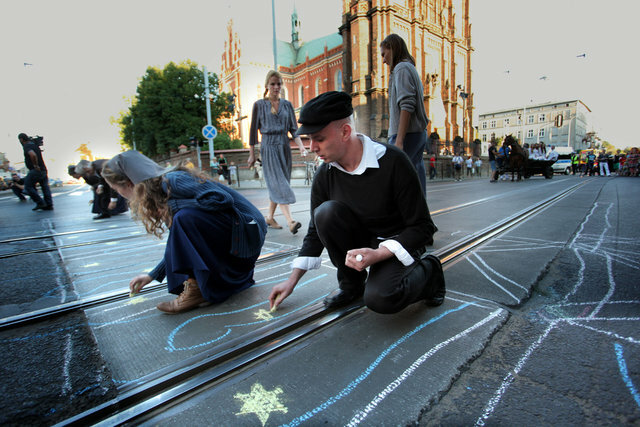 We knew we wanted our audience, Israelis and Polish alike, to cross our virtual bridge as an act of memory, out of respect for those Jews who crossed the bridge. We were amazed to see how out of 500 people who were at the event, there was not even one person who chose to cross the road not by our virtual bridge. The bridge was drawn by ​​Yoav Cohen, who practiced with us how to paint the bridge in a short time in various places in Poland.. The creation was escorted by a horse and wagon. Asia (Polish actress) found them in a small village near her house and thanks to her, the journey was led by the wagon. Wagon. 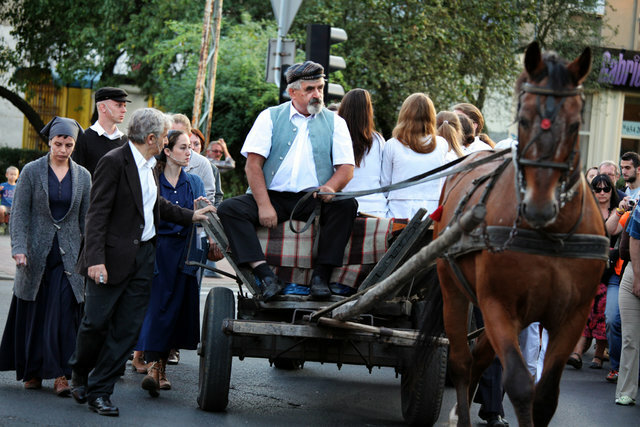 You can write so much about “The Wagon”.. Itsac Shiffer, a Lodz survivor, once told me his dream was to have a wagon. He saw the ability to sit high above and move around as symbols of freedom and dignity; so that was a wagon for a child in the ghetto. During World War Two,the Assumption of the Holy Virgin Mary Church was located within the Łódź ghetto. For thousands of Jews who had to move to the ghetto, the red brick church and the nerby wooden bridge over Zgierska Street were the most important symbols of the ghetto.In 1942, the Nazis decided to transform the church into a warehouse for storing stolen Jewish property. From spring to autumn 1942, clothes of people murdered in Chełmno on the Ner were brought there. Some people discovered the clothing of their loved ones who had been deported from the ghetto in an unknown direction.Then, inside the church, feather and down sorting was organized. The Jews called this place “white factory” and the Virgin Mary – the patron of the temple – Mary of the Down. As part of my research, I met with Dr. Michal Unger, an expert on the Lodz ghetto. 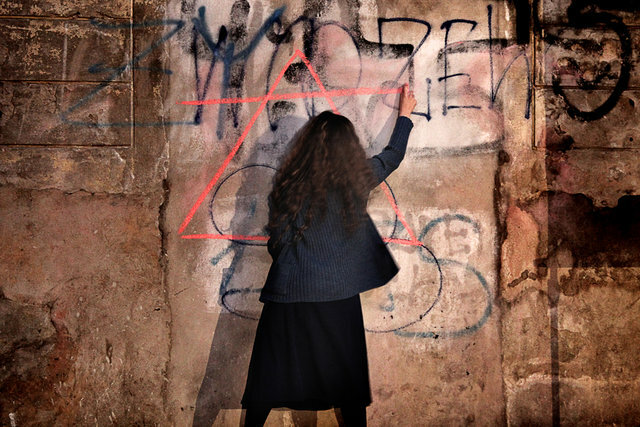 During a significant conversation with her in a cafe at the center of Tel – Aviv, I asked her: “If you had to make now a creation on Lodz ghetto, what places would you choose? What places come first into your mind? Two of her responses have become part of the work: the Church of Maria and the cultural house in the ghetto. She said that one of the strongest images from the Lodz ghetto is a picture of Mary Church full of feathers. 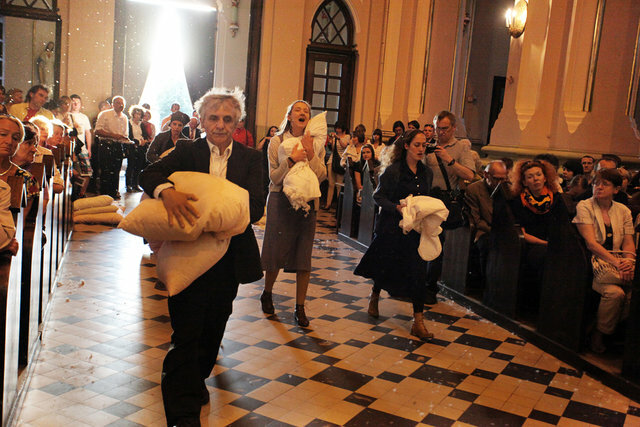 During the war, the German turned the church to a store house for sorting objects of Jews sent to their deaths and most of the objects were blankets and pillows that were full of feathers.. Indeed, we decided to work with pillows, blankets and feathers in the church and explore the topic of “dream” and “rest”, the privilege to lay my head on the pillow at the end of each day and rest, dream. We worked with the song “Dream” written by Abramek Koflovicz when he was 13 and which has been translated into many languages ​​and composed for us by Ayala Asherov. The Pillow, full of feathers, is the small sanctuary of the individual, full of soft and fragile material like feathers. The Memory, like the pillow, is a place to rest your head on and at the same time, flies easily and disappears. I have to write about the priest Thomas. Priest. Central Church. Sunday Mass. 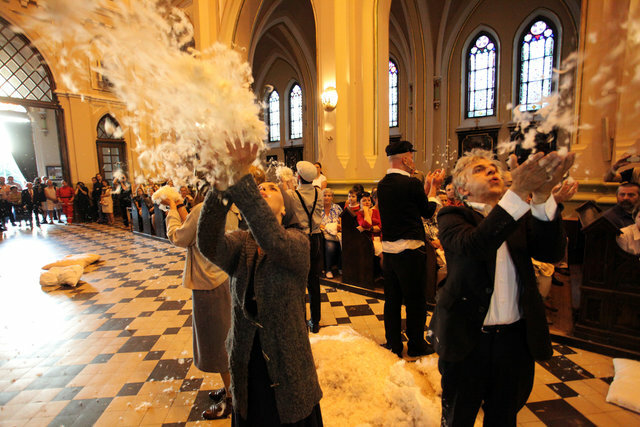 And within each of these religious legal systems, we encounter a sensitive and open minded priest that allowed us to work inside the church, fill it with feathers, dance in it. Not obvious. Remarkable. I tell him about the request of one of the survivors, who was very angry with me because I was cooperating with the Poles. “If they want us to believe that they are sorry for what happened, they should be ringing the church bells on the date of the “Zspera” so that all the people in Lodz will hear and remember”. And so it was. 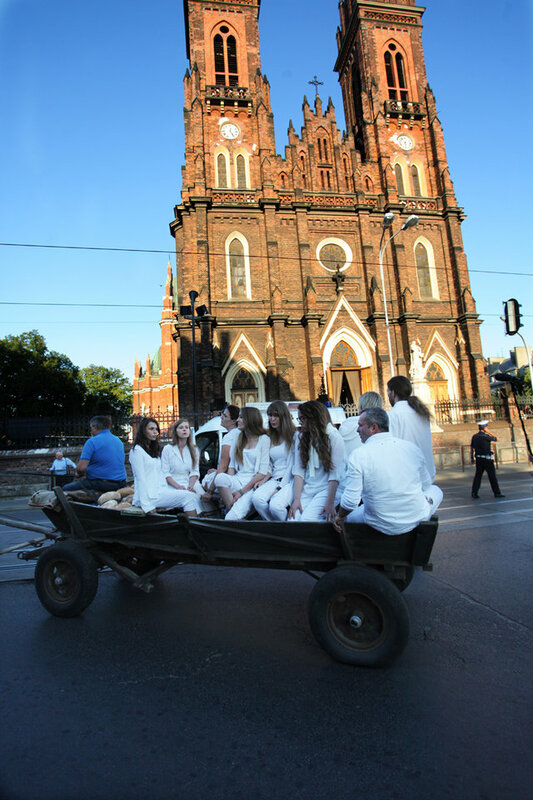 On the 4th of September 2012, at 18:00, at the beginning of our event, the priest Thomas rang the bells of the Church of Mary in honor of the Lodz survivors and in memory of those who did not survive. I am sure that the priest Thomas will be rewarded for it from the sky. documents of World War Two. as well as rumkowski’s speeches and deportees’ documentation– their passports and personal letters. now found in the State Archive in Łódź. The main picture came that to mind was of resorts and establishments working in the Lodz ghetto, for example, sewing machines ordered one after the other. Anyone who is familiar with Lodz ghetto knows that it was a ghetto of work and anyone who wanted to survive – worked. My grandmother, until her last day, worked. There was no spare moment where you could see her sitting quietly, resting or simply having a good time; she worked non-stop and this “survival movement of working” could be felt every day at home. While working on this project, I got to know many more survivors from Lodz and I felt this “survival movement of working” in everyone. “Arbeit macht frei” is not just a sentence at the entrance to Auschwitz; I think that for the survivors of the Lodz ghetto, it is an existential condition of constant inner anxiety. It is hard for me to put this feeling into words, but I’m sure the second and third generation of Lodz survivors might know what I mean. Live and work are synonyms. ‘Parasite’ is the greatest curse. The Image of sewing machines ordered one after the other in the courtyard I saw had been in my mind from the beginning. 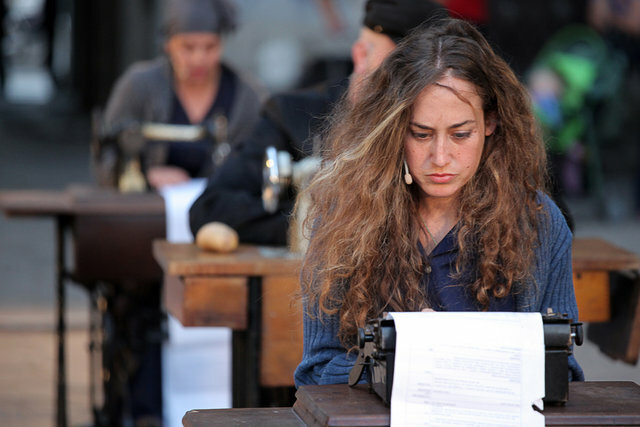 The typewriters are replaced by sewing machines and the text is sewn. Writing is work. A craft of Survival. 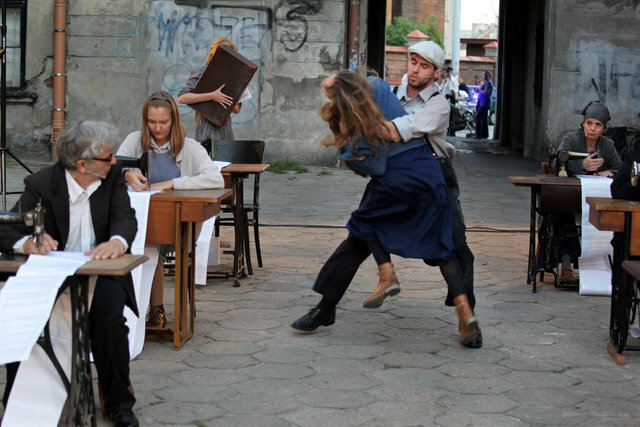 During our rehearsal in April 2012, on “Yom Hashoah”(the memorial day of the Holocaust) a strange event happened in Israel: during the show “ghetto” in the “Cameri Theater” some youths rioted and encouraged the actor who played the Nazi to hit the actor who played the Jew on stage. 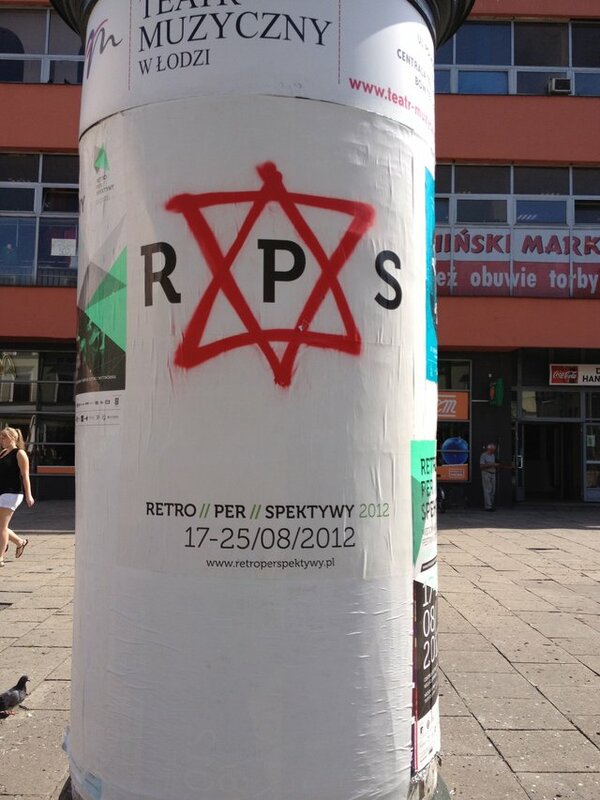 I don’t think I would have known about this ‘event’, had it not been published in the Polish media (or better to say “been celebrated” in the Polish media). Tomek came to the rehearsals with a list of talkbacks, comments on the event, published on the internet and we were amazed by the reactions: some anti-Semitic , some expressing serious concern about the memory of the Holocaust, but all interesting and raising questions about the meaning of the Holocaust today. We found that the Israelis’ responses on the internet were equally interesting and decided together to add a “Part II” to the chronicles – “Comments of Israeli and Polish talkbacks about the event that happened on “Yom Hashoah”. The typewriter was replaced by a laptop and we quoted the comments. Maybe we should say the “chronicles” of Today. I have to write about the Star of David that is scattered across Lodz. I havea full stomach but I’ll be brief. From the moment I landed in Lodz and asked nervously “What is this?” everyone tried, each in his own way, to explain to me how it’s meaningless. That the youths who draw the graffiti are hooligans who do not understand what they are doing and have no idea what a Jew is. True. True and false. The simple fact is that a Jew is still a curse. Indeed, it is a curse of uneducated people, used in the context of a football game, but still a Jew = curse. The Star of David, which no one knows what it means = something bad, despising. To mention that the Nazi Party began with a small group of hooligans and not with the higher education in Germany will be the beginning of unnecessary history lesson. Here emerge primarily questions of “the assimilation of hatred”, the meaning of the symbol and the symbolic, social codes and even aesthetic questions. I told Tomek that I’m going to paint this graffiti in our show on the wall of the chronicles building. He agreed only because he did not want to mess with the “Mad Jewess girl”. We did not know what it will create. After the first performance in April 2012, someone came up to me and said “It was a slap on the face”. Ruthie: Do you know what was here before? Children: Yes, the ghetto and all that. Killed Jews. Ruthie: Jew is good or bad? Ruthie: Well, first of all, I’m from Israel. I’m Jewish. Ruthie: And now let’s play football together. 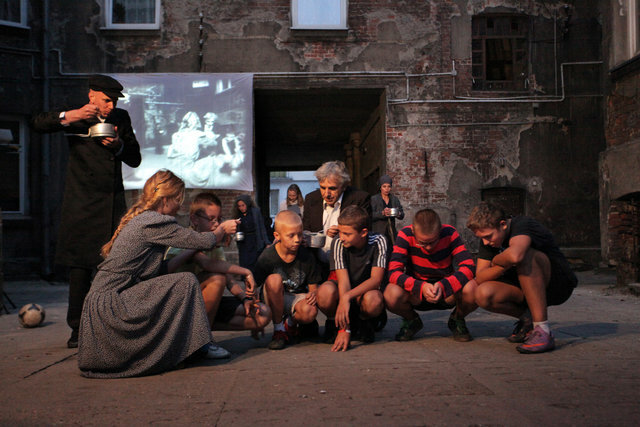 From our football game with the children, the scene in the courtyard in Walska Pulzkeigo 16 has emerged. The children playing football and Yoav, the video artist, photographs them live. As soon as he whistles they stop playing and we, the performers, enter the scene with some physical work inspired by chosen stills pictures from the ghetto (e.g. carrying bodies, eating, hiding, etc.) Once we enter the scene with the children, the video image becomes black and white, with the qualities of an old movie, as we remember, or used to seeing movies from the ghetto. Present and past merge one with the other. Once we leave the area, the children continue to play football. Every time we enter the scene – we affect it in some way (e.g. leave an old hat on the head of one of the children, take a child with us and finally leave a body in the “football field” and the children continue to play while it is there). This is one of the most significant scenes for me. For Tomek and for me it was very important to involve the people living in this neighborhood in this artwork, which is really what had happened with these kids. From choosing the children, rehearsing with them, meeting their parents, till the event itself. I’m not naive to think that next time they are asked whether a Jew is good or bad they’ll say good. But I think that on many layers it was a significant encounter for all of us. It is hard to believe that this small building, where today a local shop is located, used to be a cinema. The auditorium held 400 seats and a stage, where both symphony orchestra and theater troupes could perform. This was the center of the ghetto cultural life: concerts, theater performances, exhibitions and poetry readings. The house of culture offi cially opened on March 1, 1941, although theater performances and concerts had been held there before. The residents of the ghetto attended both classical music concerts and light entertainment shows. In the fi rst year, revue performances were staged 85 times. The troupe consisted of prominent pre-war Jewish artists, including Moshe Puławer and róża Bloch, the orchestra was by conducted by Dawid Bajgelman, decorations were prepared by Pinchas Schwarz. After transports from Prague, Berlin and Vienna arrived at Litzmannstadt, world-famous virtuosos performed there, along with children from orphanages. 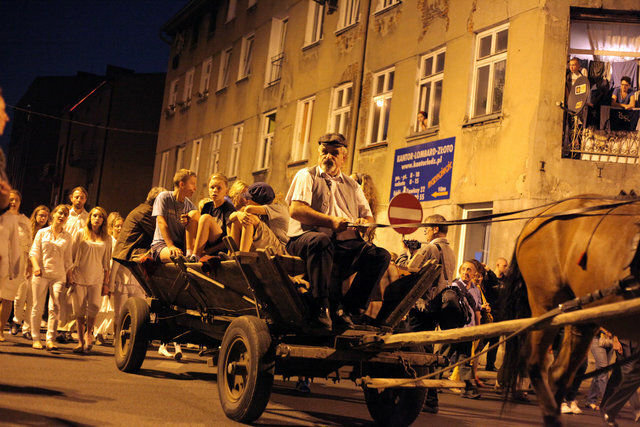 After “wielka szpera”, cultural life in the ghetto practically ceased to exist. Germans deported many artists to Chełmno. In the summer of 1943, the building was converted into a department of quilts and blankets. In the Building where the “culture house” used to be, there is now a Super Market. Ironically, this raises interesting questions about culture and “consumers’ culture”, about the relationship between food and culture. I remember a history lesson on “rebellion and heroism”, which spoke not only about physical uprising like that of the Warsaw ghetto, but the “choosing of life”, the uprising of the human spirit – choosing culture, faith, friendship, keeping one’s ethics and morals ​​in impossible conditions. For me, the “Culture House” in Lodz ghetto is one of the most unique examples of the “Choosing of life”. When I met Dr. Michal Unger, she told me about an incident that happened in the “Culture House” in which a singer sang a song called “Close Your Little Eyes”, written by Yeshayahu Spiegel in Yiddish and composed by David Beigelman. In the song Spiegel is talking about his little daughter. They’ll flutter by your bed. The house in ash and sand! 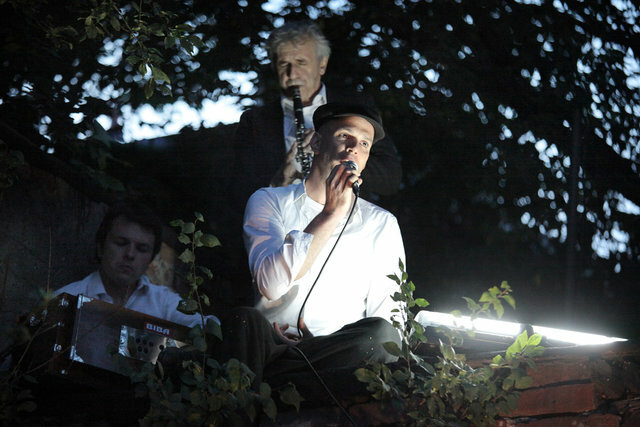 On hearing the song, the crowd began to cry and Rumkowski, who sat in the front row, was furious and demanded to know who had written the song and brought more sadness to the ghetto. He wanted to send Yeshayahu Spiegel to Chelmno. Due to associates who spoke of Spiegel’s rights, he remained in the ghetto. 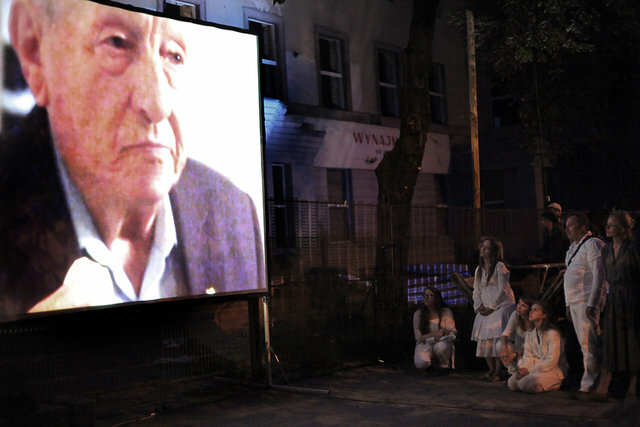 In the “culture house” we used testimonies of survivors from the Lodz ghetto and projected them on televisions in supermarket trolleys. In this scene we asked ourselves questions such as: What do these testimonies mean for us today? Do we or don’t we want to hear these testimonies? 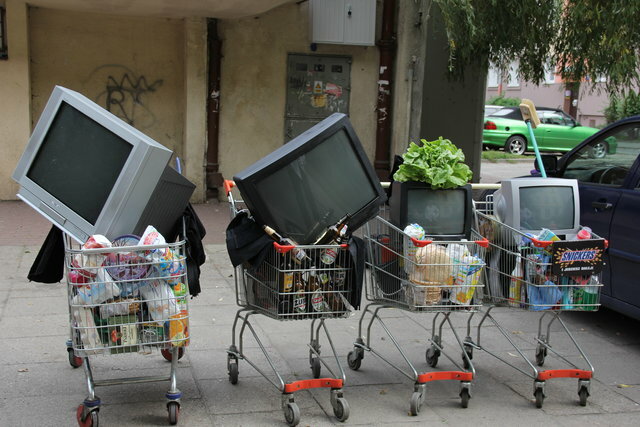 Are they part of what we “consume” in the Polish and Israeli cultures and what we do with them? The hospital building was completed and opened just before the war. It was one housed the Department of Health created by rumkowski and Hospital No. 1. In one of the wings, there was the private apartment of the Eldest of the Jews in the ghetto. until September 1942, health care in the ghetto functioned more or less normally. Patients were examined (including lung x-rays), prescriptions were written, although the most common documents issued were death certifi cates. It was only during the September “szpera” that all hospitals were closed down. It was done in a very brutal way. 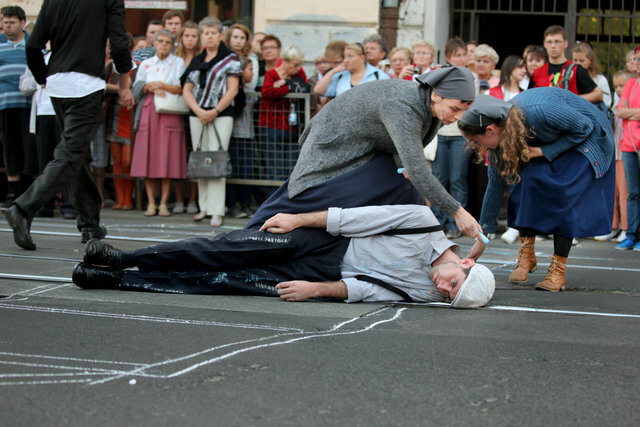 The most dramatic events occurred at the hospital at Łagiewnicka St. The Germans deported all the sick to Chełmno on the Ner. The point of assembly for people selected for the deportation from the ghetto was located here. On the other side, at 37 Łagiewnicka St., a hospital for children was located. During “szpera”, it was a place where children of dignitaries, high-ranking offi cials of the Jewish administration and the police were hidden from deportations. One of the places that was the most difficult to work with. 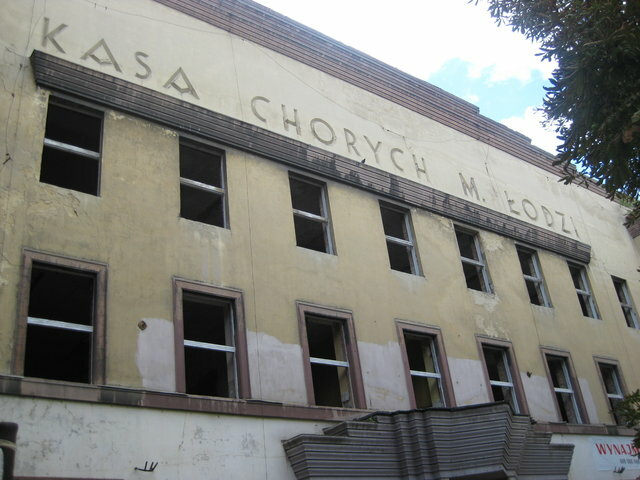 The testimonies of survivors that the Nazis threw the sick from the windows of this building during the Zspera shocked us. What can we do in this terrible place? The open, gaping windows looked wide-eyed watching us, or like black holes to an unknown place. During the process of the rehearsals, we got permission from the landlord to enter and work inside the house – a long and complicated process of contacting the landlord began with our attempts to enter the building and ended with our receiving approval to work in it. 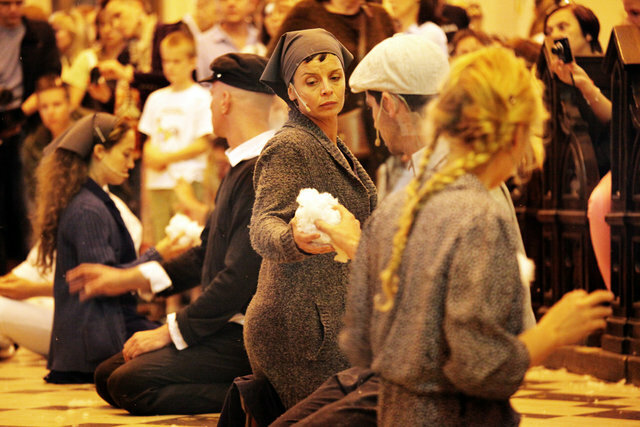 Eventually, we even performed there on “Yom Hashoah” 2012. However, for the event in the summer, the landlord didn’t let us enter the building, which was under construction, without a permit and we decided to use the building from its external side only. The choir sang the song of Rabbi Shlomo Carlibach with words from the Psalms “Even though I walk in the valley of the shadow of death, I will not fear evil because you are with me”. We stood outside staring into the empty windows. 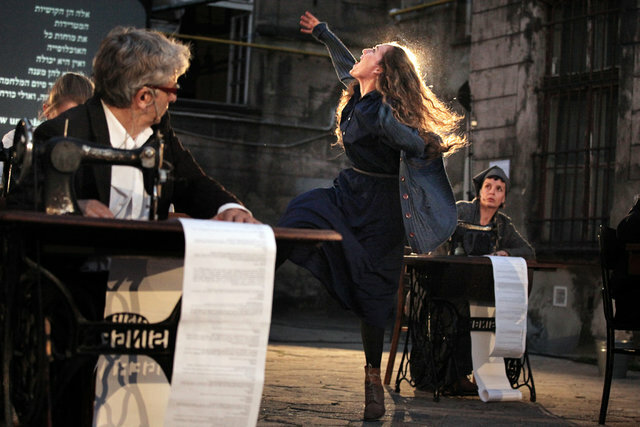 Finally, we screened a film of Lodz survivors dancing, a film we had shot in July 2012 in a very special building in the center of Tel – Aviv called “The Lodzia house”. The dance of the survivors is a symbol and call for life and living. The survivors’ ball. This was the first part of the project, located in Lodz – Poland. During 2013, we will bring the project to Israel. Currently we are looking for appropriate and proper way to do the project in Israel. 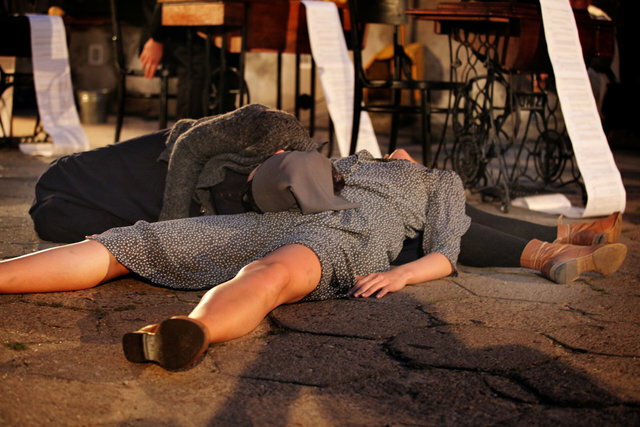 We intend to integrate Lodz survivors in performance. Acknowledgments: Organization of former residents of Lodz in Isreal, Lodz survivors, Uri Weizenberg,Zlila Bourkay, Zvia Frid, Dr.Michal Unger, Pawell Spodenkiewicz,Arie Rozen,Nir Turk, Chorea members, Stage Center.